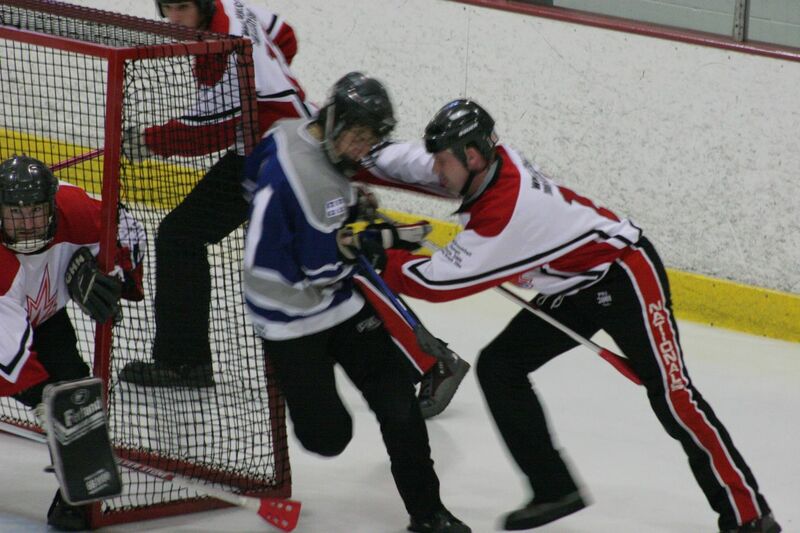 Broomball is a sport similar to Ice Hockey. Except that a number of significant details separate the two sports. Broomball is played on an ice rink in sand shoes (sneakers) instead of skates. The game consists of 6 players from each team, on the ice (Goal tender, 2 defenders, 3 forwards) with up to 14 players on the bench as reserves. The object is to (hopefully) score more goals than the opposition. A small ball about 5 inches in diameter is propelled about the rink with a paddle shaped stick. The game consists of 2 twenty minute periods. Two referee's control the match. Equipment used are Broomball shoes which have about an inch of soft rubber on their sole are the basis for the unique traction on the ice. The ball, of similar material to a basketball, but about 5 inches in diameter. The stick, originally a straw broom, dipped in water, and frozen to provide stiffness, has been progressively replaced over the years with high tech rubber, paddle shaped sticks, with either a wooden or aluminum shaft. Ice Hockey helmets are used to provide protection to the head and temple region and are mandatory. Knee and elbow protection are used to provide protection to these extremities upon contact with the unforgiving ice surface. Some players use padding around the hips and rear, to provide additional cushioning. Protective gloves, less bulky than ice hockey ones and specifically designed for broomball are worn to provide protection for the fingers and wrists. Anyone can play, there is no need to be able skate, and Broomball teams are available in a variety of configurations, from Women's, Men's, Coed, in highly competitive leagues, to a more social match. Broomball caters to all. Different grades cater to differing skilled players with many countries (particularly Canada, and the USA), offering several different leagues, and a highly professional support organisation. 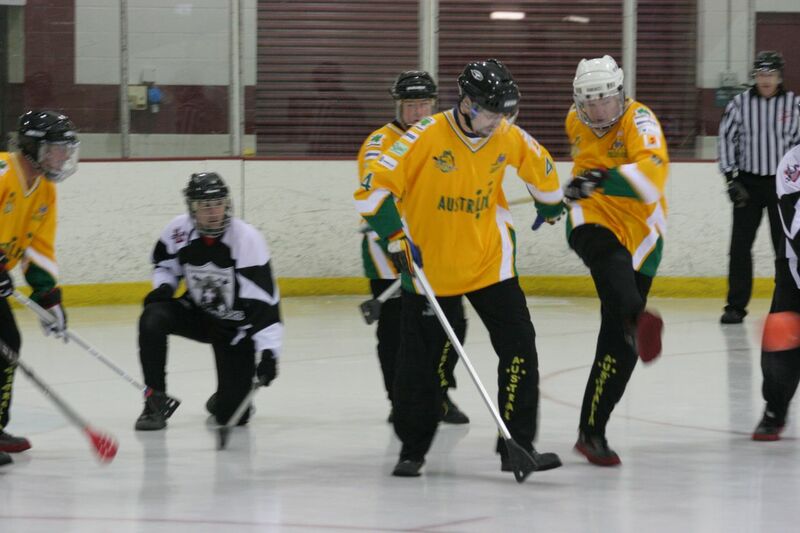 The team play, and some of the rules are similar to ice hockey, but many aspects of Broomball differ. Such as the speed, degree of contact, equipment used, skills etc. Broomball tournaments are held in all parts of the world. From university intramural tournaments, to church functions, winter carnivals and of course league events. Many Tournaments held are also highly competitive in nature. With the top teams attending from all over the country. They are highly skilled athletes who excel in their sport and offer an athlete a chance to compete against others of similar skill levels. Most counties offer their players state/provincial, and National Championships, with the chance to compete every few years at a World Championship event. The Russian Style Broomball is currently played in Finland and Russia. Instead of the standard used in more traditional broomball, the Russian style uses a shortened stick, with a field hockey style hook at one end and made from bound raffia. The game is played either indoors or outdoors on either a 1/2 hockey rink, or a tennis court (iced over of course) sized rink. Rules are similar, but kicking is not allowed, nor are you able to touch the ball with your hand. They run their own world championship. Intramural Broomball is played by University or College age players. Usually either within a faculty or between faculties, and less often between educational institutions. The skill level is often fairly low, but the social aspects are strong, and this is often a players first introduction to the game. The sport is often played with rules modified to suit local conditions. With such rules as, no checking, no broomball shoes, no lifting the stick above the shoulders etc. The thrust of these games is more focused on fun that actually winning the competition. Organised broomball started in Canada in the early 1900's and progressed from early matches where corn brooms propelled a soccer ball about the ice, through to frozen brooms to the current sophisticated composite brooms. Winter carnivals provided the early competitions for broomballers, which later developed into provincial, and eventually National associations, culminating in the 1st World Broomball Tournament held in Victoria, British Columbia in 1991 and subsequent events. There are at least five different stories on the origins of Broomball. One story has it that street car (tram) drivers, used to hit a small ball about the ice in winter during their lunch breaks. A second has it that a group of soccer players were intrigued by a small boy swatting a ball with a toy broom. The third would have it that Broomball started as an avenue for non skaters to participate in the rough and tumble of Ice Hockey. The fourth option describes the origins of Broomball arising out of the desire by women players to be involved in Ice Hockey, as this was then impossible in the male dominated and controlled sport, broomball was started as an avenue for women participants. The fifth story is that broomball was started by the Indians of Eastern Canada, using a ball and stick and tree stumps for goals. It was at the time called stickball. This final theory is probably the closest to the origins of the sport, and interestingly bears many similarities to the origins of field hockey as well. One of the first recorded games was played in Saskatchewan in 1909, and Ontario in 1911 but there are indications it was played as early as the 1890's. 4 Guests Online and 2940096 visits since 25 July 2006.